Estonian composer Erkki-Sven Tüür (b. 1959) admits that we are products of our environment. To be sure, he and his compatriots would seem to have carved out a distinctive niche in the terrain of classical music, chipped from the ice that locked their creative heritage under Soviet rule. In the same breath, however, he cautions us about adhering our identities to any particular place over another, lest we shun the illustrative details of our indeterminable experiences. In that sense, there is something to be said for music, which in Tüür’s case is as close to audio refraction as one can get: there is no distinguishing its inner and outer upheavals. Enter architectonics, an abiding process through which Tüür discloses the chemical compositions of his singular auditory experiences. As a onetime prog rock musician, he brings a “band” sensibility to his sound, in which one hears an undeniable cohesion. Architectonics VI (1992) for flute, vibraphone, and strings descends from violins into a series of complex resolutions. It is mathematical in the truest sense, making a case for chaos as its primary expression. Convoluted outbursts from winds, neither spastic nor deliberate, are punctuated by strings, shining a light into this lively debate of inter-instrumental politics. Passion (1993) for string orchestra is a rare achievement. Its development recalls Henryk Górecki’s Third Symphony, working its way from ground level into the stratosphere of our emotional purview. Its shifts from minor to major keys glisten in a dew-drenched field, accepting the sun’s slow rise. There is, in this piece, as much lateral movement as vertical. Each stage is both a revival of the past and a rehearsal of the future. As the upper strings tighten their grip on reality, the cellos resound with a note for the ages, not unlike a certain tenor’s proclamatory crest in Arvo Pärt’s Magnificat, if relatively foreshortened. Illusion (1993) for string orchestra dances with every sinew of its bowed body. Though brimming with dynamic suppleness, it turns every statement into a new paragraph. As double basses mark staccato points of articulation, violins reassert their seemingly innate desire to lead. Tõnu Kaljuste’s immaculate direction brings phenomenal dynamic control to bear as the piece builds into an ecstatic reinstatement, an aesthetic lock that grows progressively quieter until the final exultation. Crystallisatio (1995) for 3 flutes, glockenspiel, strings, and live electronics ushers us into a congregation of drowsy banshees, draping themselves in the canopy of a darkened forest. Electronically processed flutes echo like spirits recast in the image of their own reflection. The cellos are given a mournful urgency, through which they enact a promise of daylight. The glockenspiel’s doublings tickle our very spirits with their arousing pinpoints. The frenzy mounts as the processing reveals its illusions more explicitly. We end on an overblown flute and a single glockenspiel note—a drop in the cosmic pond. Requiem (1994) for soprano, tenor, chorus, triangle, piano, and strings is the masterpiece of this program, and beyond reason enough to buy this album. Written for friend and conductor Peeter Lillje, it gives us the clearest portrait of an artist working in real time. A struck triangle opens the proceedings, from which baritones spin the Introit. Strings operate sympathetically as the cellos double the tenor line, and the violins skip along their own skyward paths. A tenor introduces the Kyrie eleison as the violins continue their improvisatory pirouettes. Vocal constituents volley back and forth, while at their center a piano comes crashing down in a rupture of spiritual information. Altos and sopranos emerge from the rubble as wavering sirens. They keen and shout in Orff-like exuberance before cracking open a breathtaking Rex tremendae in tutti. A lithe soprano provides reflection in the Recordare. A violin wanders abstractly in timid, almost insectile, commentary. All the while, choral forces are gathering themselves toward a somber end that reenacts the cycle’s beginnings. Violins play a key role throughout, scratching like an animal searching for something buried but long decayed, a kernel of faith long sprouted into the tree under which it claws in vain. The triangle that opens and closes the Requiem is proof positive that the most direct access to enlightenment isn’t always the grandest, but that sometimes the keyhole rupture of the blinking eye, and the single glint of light upon the tear that falls from it, are sufficient to show the way. The piano, too, plays a commensurate role, a voice of reason at center stage. This is a transportive album—absolutely so—and one that I will always champion. Like the frozen surface of the jacket photo, it seems at first glance a field of stars, forever locked at the height of brightness. 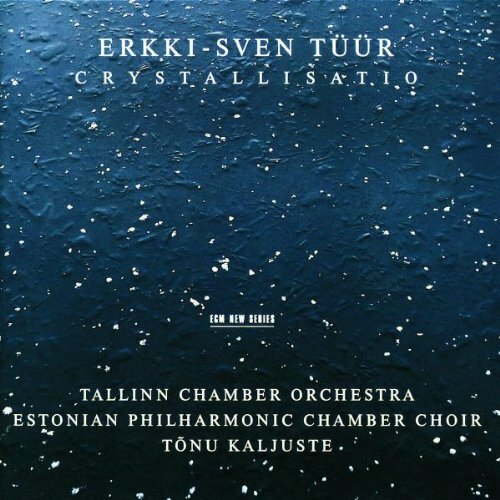 Although I do not feel that ECM’s subsequent Tüür releases have quite attained the magical realism of this one, anyone who shares an enthusiasm for Crystallisatio would do well to place the others alongside it. Tüür’s resolutions are always revolutions in that they, through the promise of completion, only bring forth further fragments for consideration. Rather than trying to achieve balance through this process, Tüür seems to want to make a meta-statement regarding the nature of his compositional process, which is constituted by a need for discourse and reevaluation. Like the tintinnabulations of Arvo Pärt, his atmospheres lay out for us the very topography of a nameless musical environment. Every turn brings about a new needle of contention by which to sew our physiological threads. This is music that makes no promises, yet in doing so fulfills countless numbers of them. As one of ECM’s most groundbreaking releases, second perhaps only to Giya Kancheli’s Exil, this is a must-have for the New Series enthusiast.